TOKYO (AP) — Tokyo Olympic organizers said Friday that a system of layered screens would be used to keep bacteria levels within “agreed limits” for triathlon and marathon swimming in heavily trafficked Tokyo Bay. Hidemasa Nakamura, executive director of sports and games delivery, said a triple-layer screen of polyester fiber was tested in July and August on dates corresponding to the Olympics and Paralympics in two years. “The triple-layer screen was proven effective in controlling E. coli bacteria and other bacteria,” Nakamura said through an interpreter. He said the international federations that govern marathon swimming and triathlon had seen the test results. “They agreed the test results were quite favorable,” Nakamura said. Plans would seem to call for the screens to encircle the area for marathon swimming and triathlon. The Rio de Janeiro Olympics in 2016 were plagued with severe water pollution, from rowing events to open-water swimming to sailing. Tokyo’s challenge for the 2020 Games seems smaller. But a core problem in both places stems from holding outdoor water events in the heart of the city rather in cleaner waters away from the urban area. In Rio de Janeiro, television rights holders pushed for sailing to be held in heavily polluted Guanabara Bay, partly because of the picturesque backdrop and appealing camera angles. Nakamura said something similar in explaining why the Odaiba Marine Park, in the heart of Tokyo Bay, was chosen. The Odaiba Marine Park sits at the foot of Tokyo’s famous Rainbow Bridge. A half dozen signs around the small beach say “No Swimming” allowed. On a recent day, one small child was wading in shallow water, but no one else ventured into the sea along the 200-meter (yard) stretch of beach. However, over the summer the public was allowed to swim for about a week under a program called “Odaiba Plage” — a takeoff on Paris. The park for decades has held many national open-water swimming competitions. 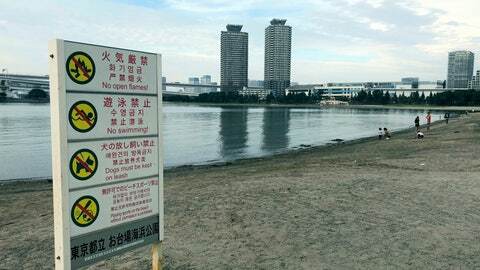 Nakamura said the no-swimming signs were there because life guards are not on duty, and not because of water pollution. “Some kind of underwater screens would be used during the Olympics and Paralympics,” he said, noting the exact configurations could change as the city and organizers experimented. Dangerous water-borne viruses were a large concern in Rio, but Tokyo organizers indicated that sports federations seemed concerned only with monitoring bacteria. Nakamura and an official from the Tokyo city government said they were confident the screens would keep athletes healthy. Some rowers and sailors got ill in Rio, but it was often difficult to link the dirty water to the outbreaks. Local sailors seemed to build up immunity to the dirty water.